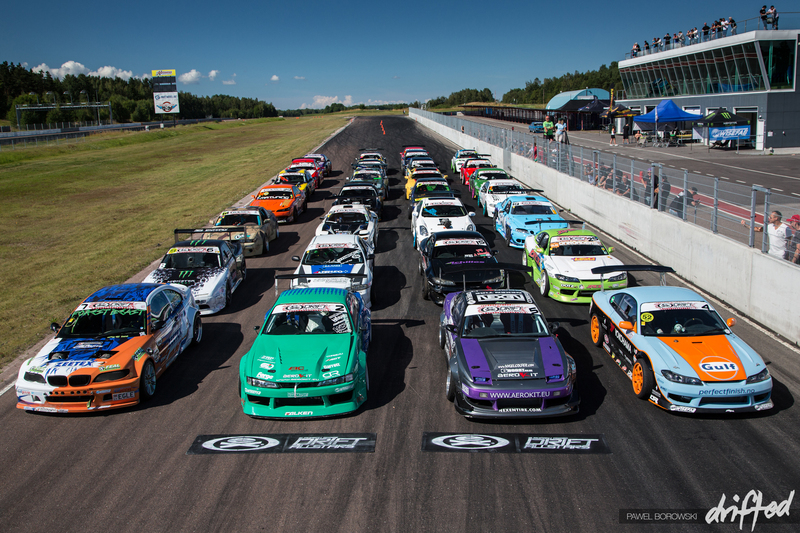 Drift Allstars Europe would make it’s second appearance in Scandinavia this year. This time at the famous Mantorp Park, just south of Stockholm in Sweden. 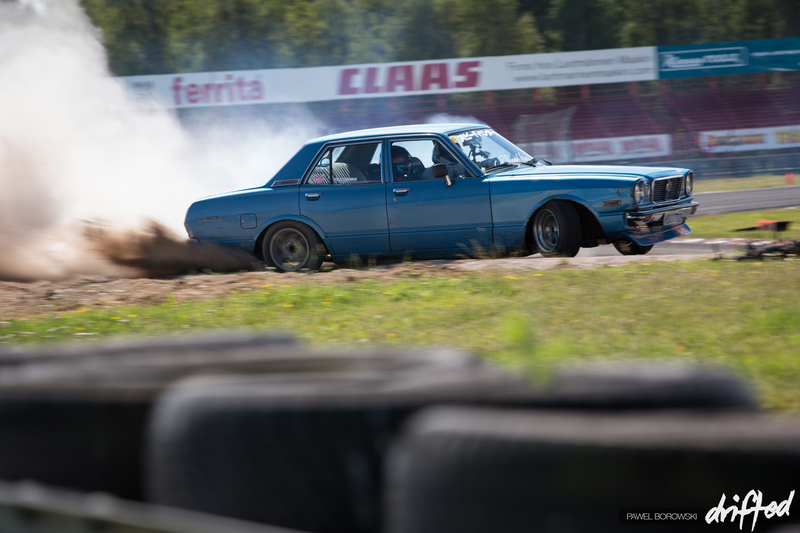 The home of Swedish drifting has it all – Swedish drift championships, Gatebil events, Swedish touring car series and now the Drift Allstars European Series. 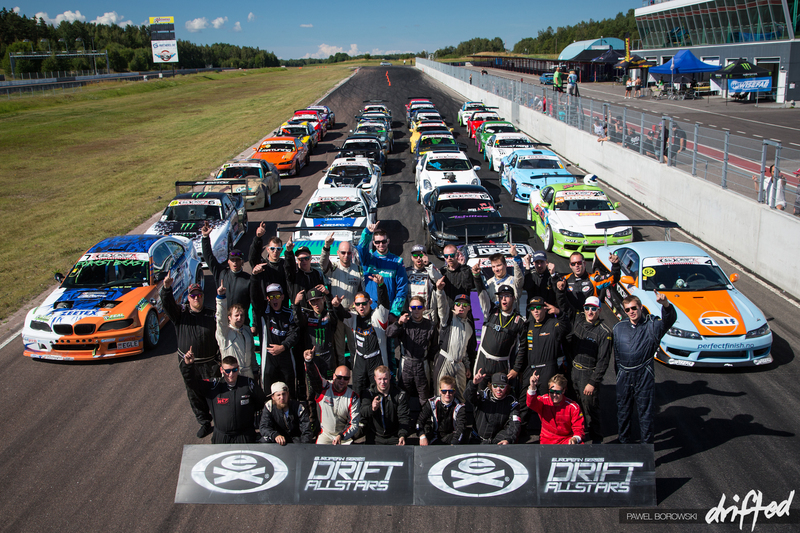 With a stacked out grid with 40 drivers from 12 countries, drifting has real momentum in Sweden. The picture above says it all – over 15,000bhp on show (an average of 650bhp per car), and eight major tyres companies represented in the front two rows alone! 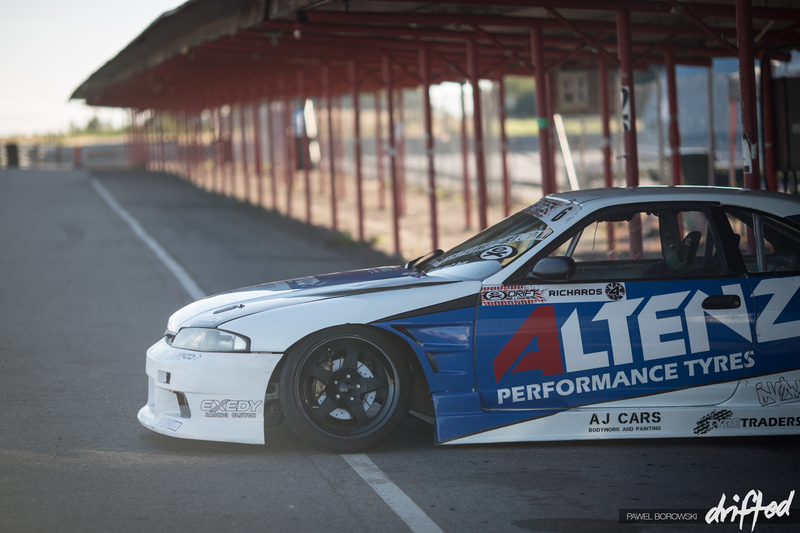 Martin Richards was back in his mega low and wide custom 1JZ-powered Altenzo tires Nissan R33. 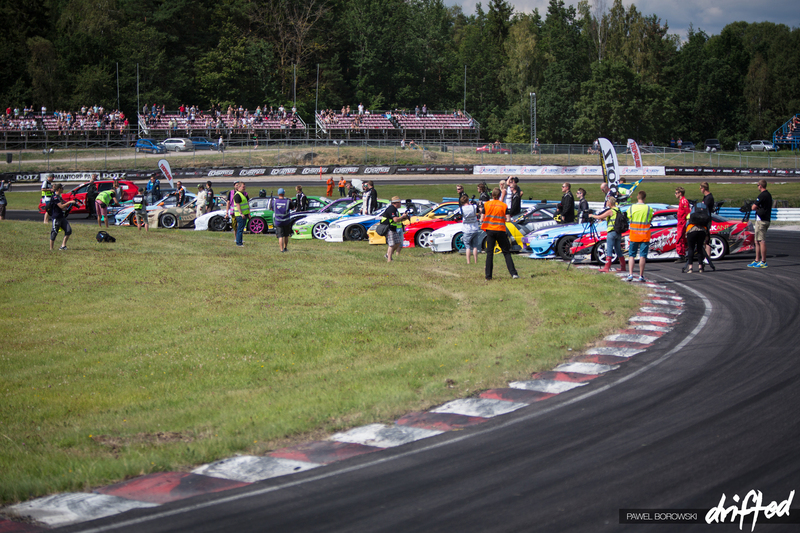 The world famous Fail Crew had debuted the 2014 look cars a week earlier at Gatebil Rudskogen. 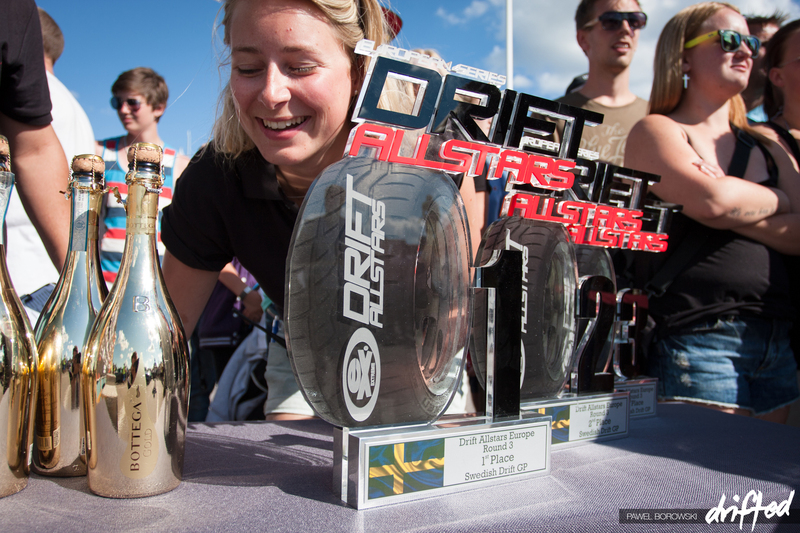 Now the team would make its 2014 competition debut at Drift Allstars in Mantorp and will contest the rest of the season. 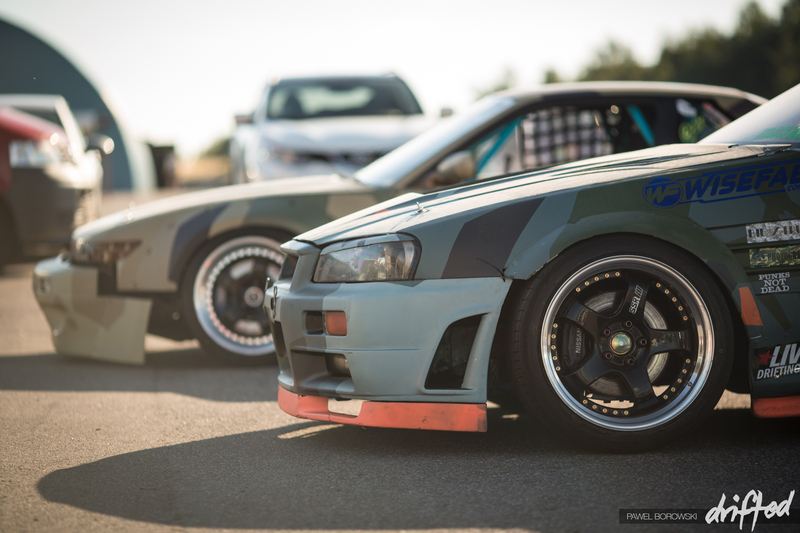 Mad Max Tvardovskiy was also present in the crazy wide body fail crew R34. The Danish smoke was supplied by Dennis Hansen. A lot of drivers found the new layout at Mantorp quite tricky. From the offset it looked quite easy but when driven under the required driving line with outside clips, everyone was put on the edge of their comfort zone, causing a few off-track spills. Mix in a high speed entry and Mantorp park had it all! 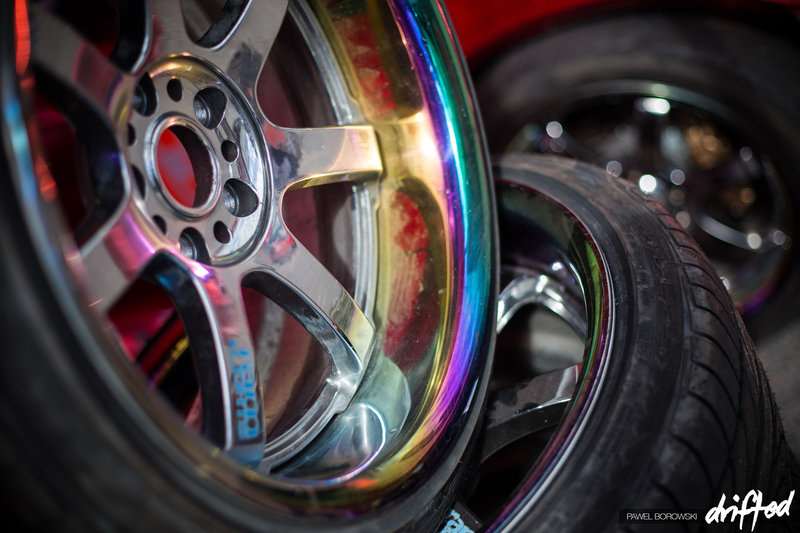 Martin Richards showed proper fitment with his wheels while making sure his R33 was as low as possible. 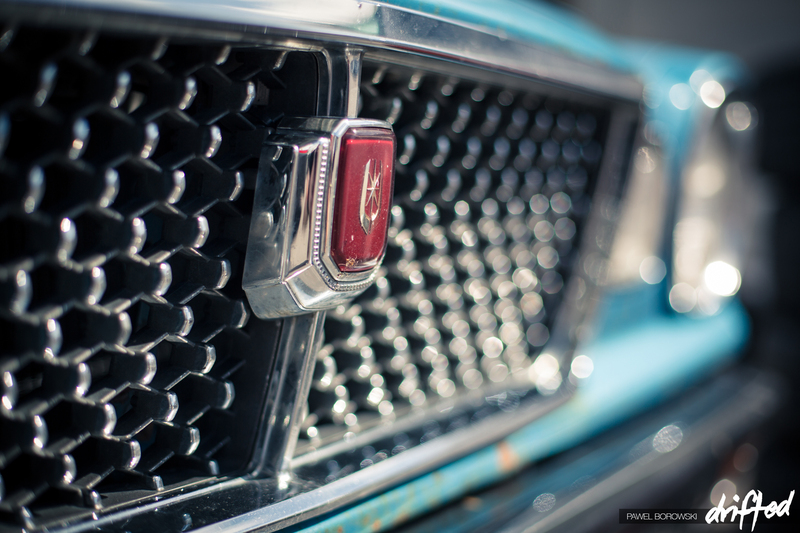 Martin would struggle with the current power race, being one of the the very few cars under 500hp. Fredrik Sorlie would make the trek over from Norway with Underground Garage and got in on track for some public track time. 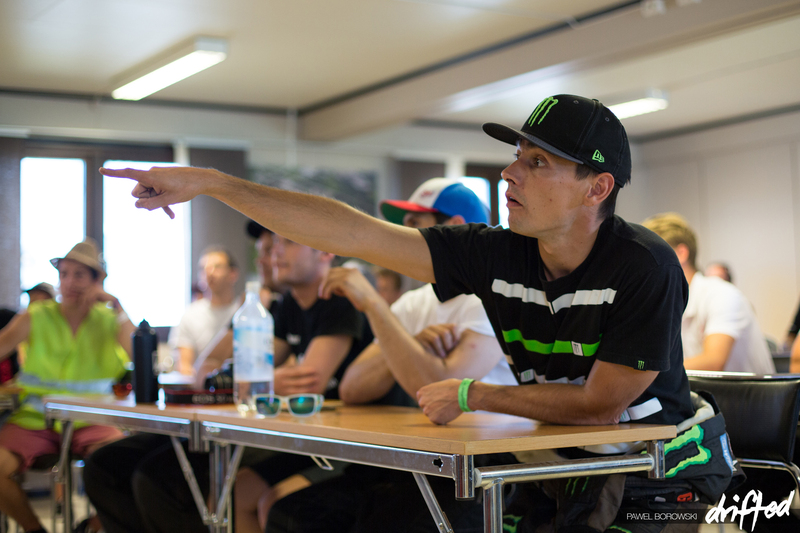 The DA officials go through the drivers briefing pre-event. Ukrainian Dmitriy Illyuk always has something to say! Watch out what the DA media team via Aatomotion has coming in store for their Sweden viral edit. 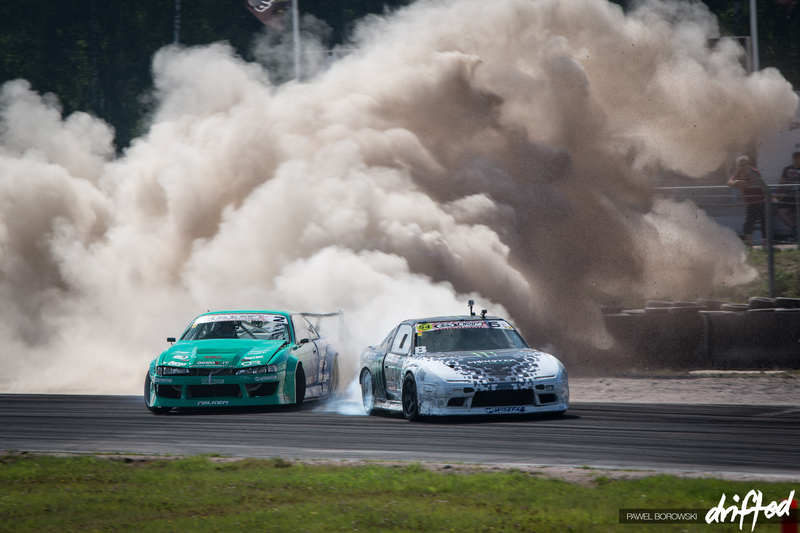 A totally different perspective of a drift event! Martin Richards gives you an idea of what might be coming! James Deane was on form and on song. 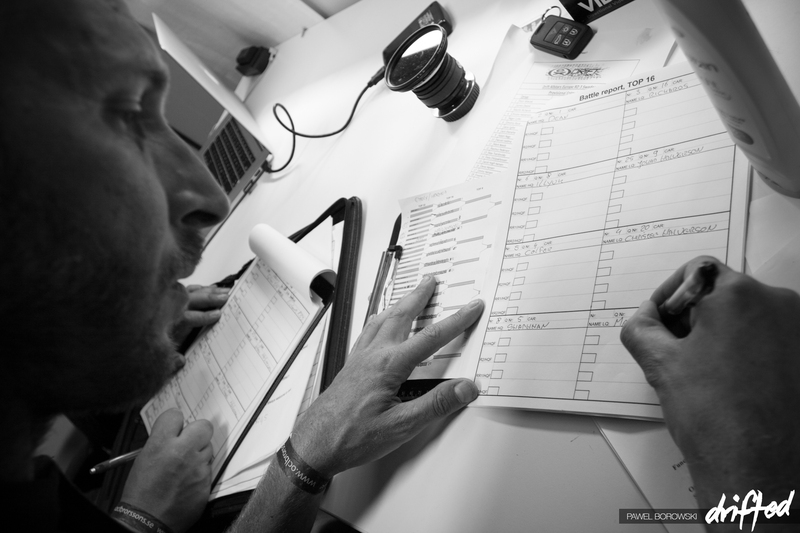 He would need to gather as many points as possible as the BUDMAT duo of Dawid Karkosik and Piotr Wiecek would miss this event due to a national event. Using this as there drop score this will set the championship alight as we go to Riga, Latvia next week. Andreas Magnussen in his crazy Jaguar V8 powered Calibra! 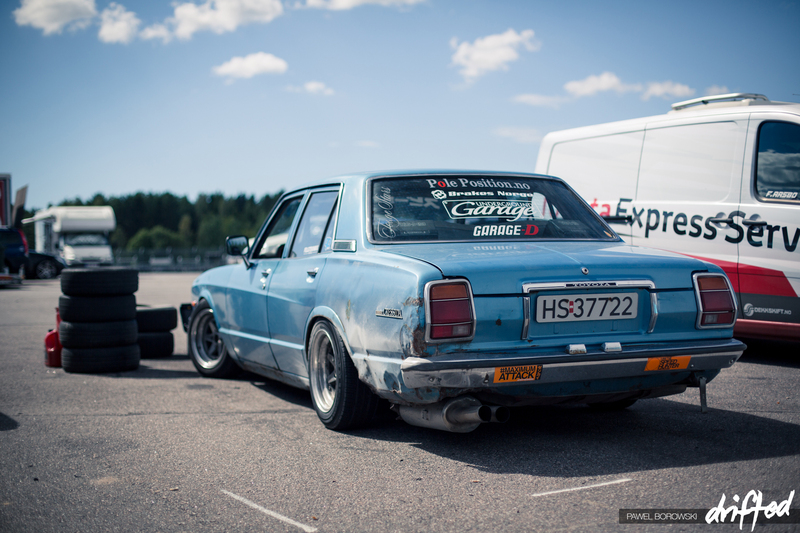 Christer Halvorsen was back on duty smoking up those Yokohama ADO8’s. 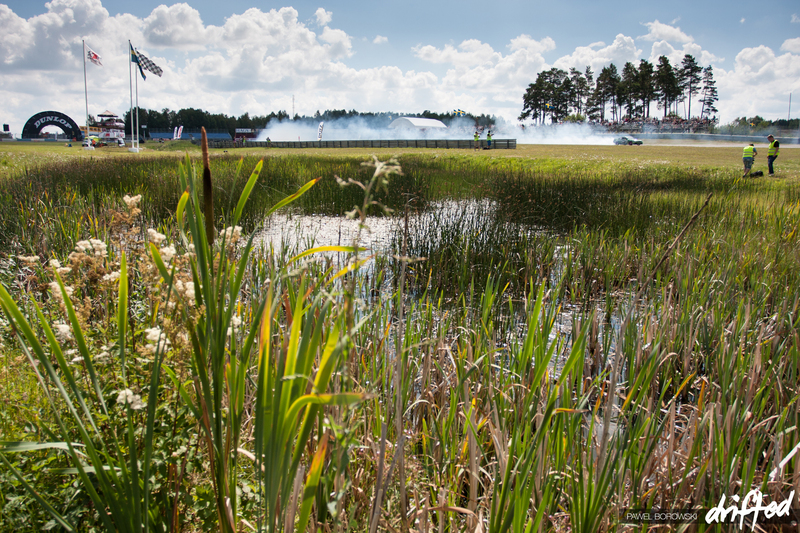 Scandinavian countryside at its best and with a racetrack! 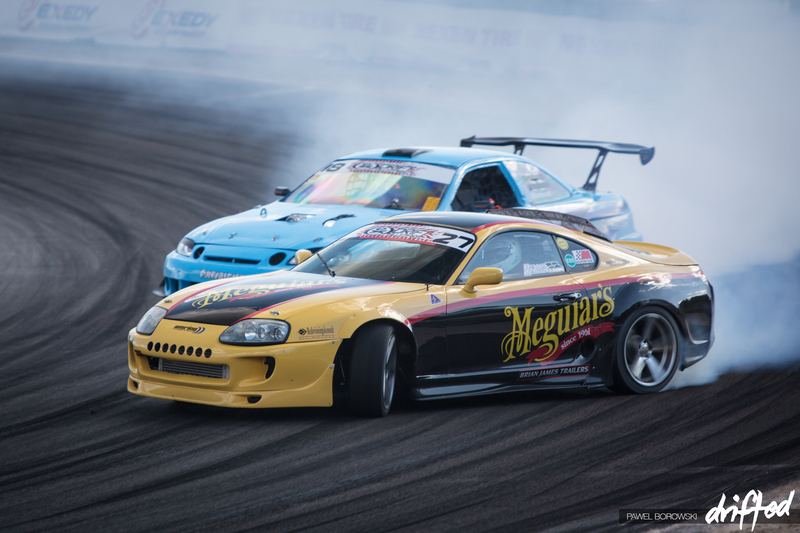 Joachim Waagaard ran into difficulties on Saturday with his insane V8 powered Mazda FD RX7 after having a subframe failure at Gatebil the week before. Parts needed! 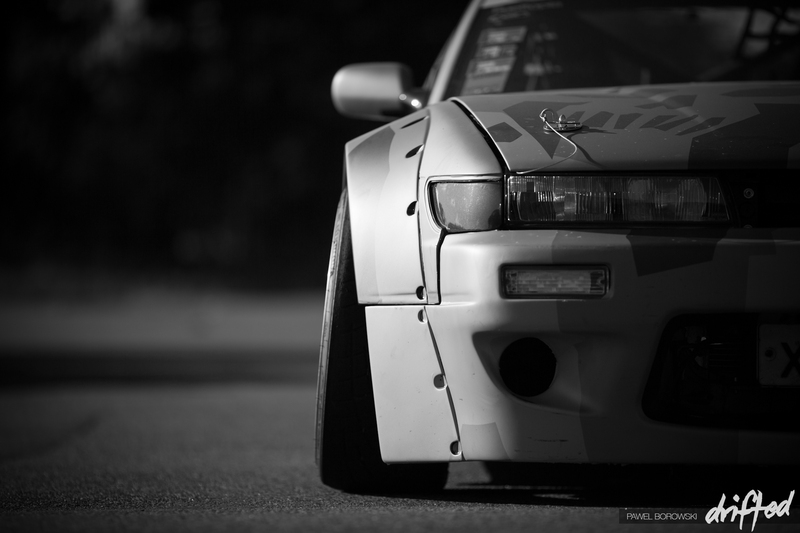 Drift cars do break a lot! Mantorp was no different testing drivers and cars! Espen Kristiansen would be a great addition to the judging team. 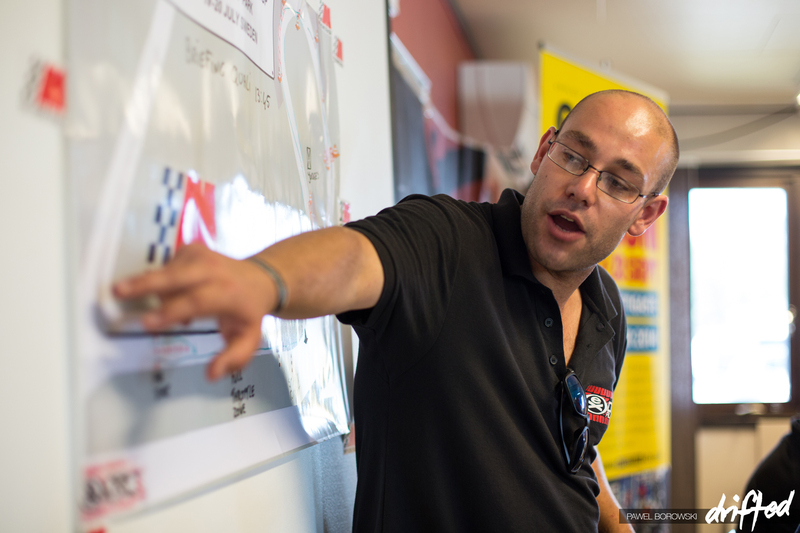 Being the seasoned head judge of the Gatebil events and having judged the Gatebil events at Mantorp park local track knowledge would be everything in judging Europe’s best at Mantorp. 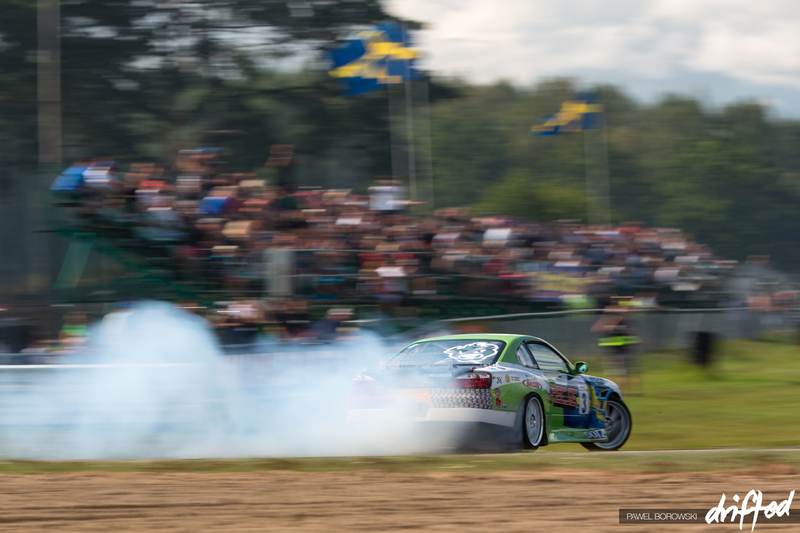 Johan Halversen would be out to prove a point as one of Sweden’s top drifters. 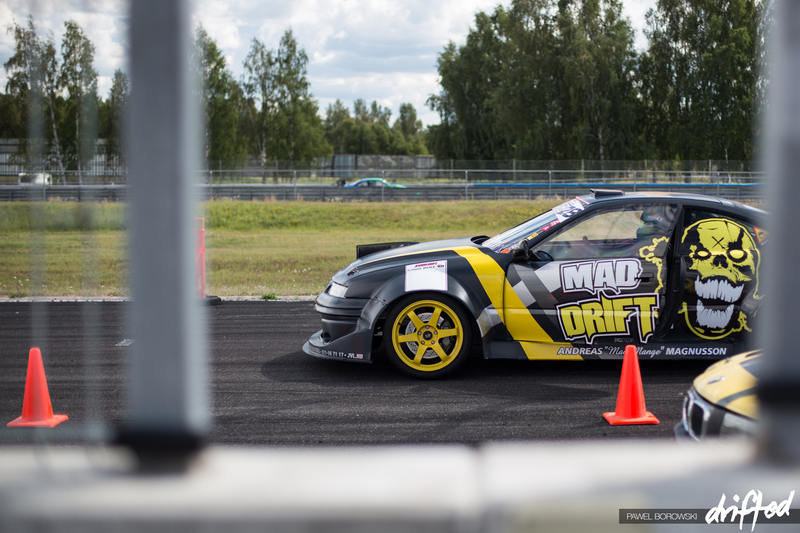 Johan finished top 8 in the 2013 Drift Allstars events and is attending some more of the eastern European events in his insane 750hp 2JZ powered S15. 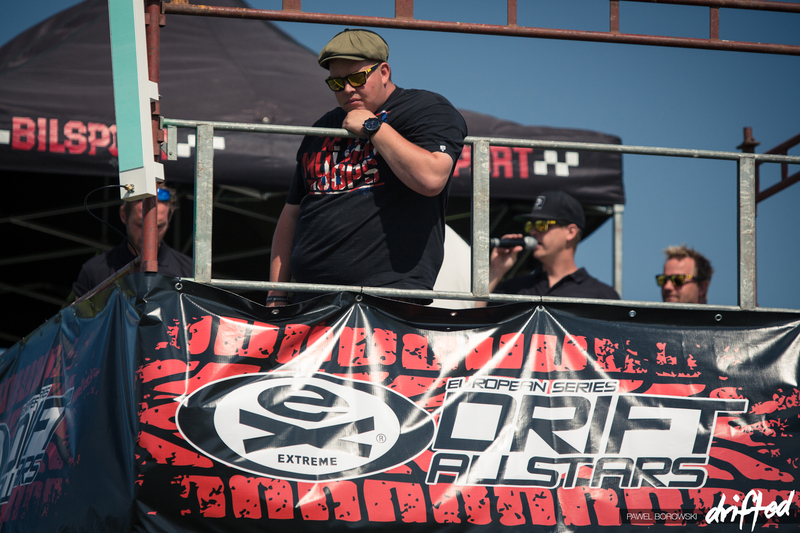 Olaf Commijs, head judge of Drift Allstars, hard at work! Lots of rubber being laid down. 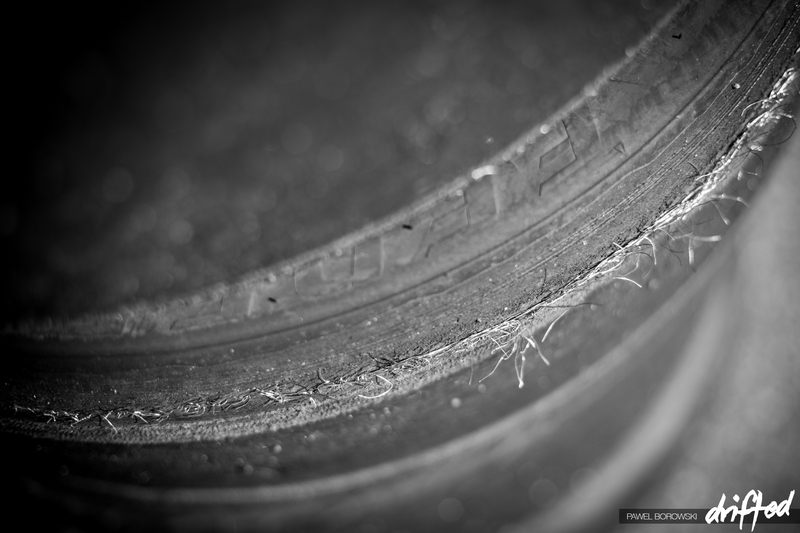 With the course lasting just over 24 seconds most cars could only just about manage two laps to one set of tires! James Deane smoking up his Falken RT615 tires all weekend. 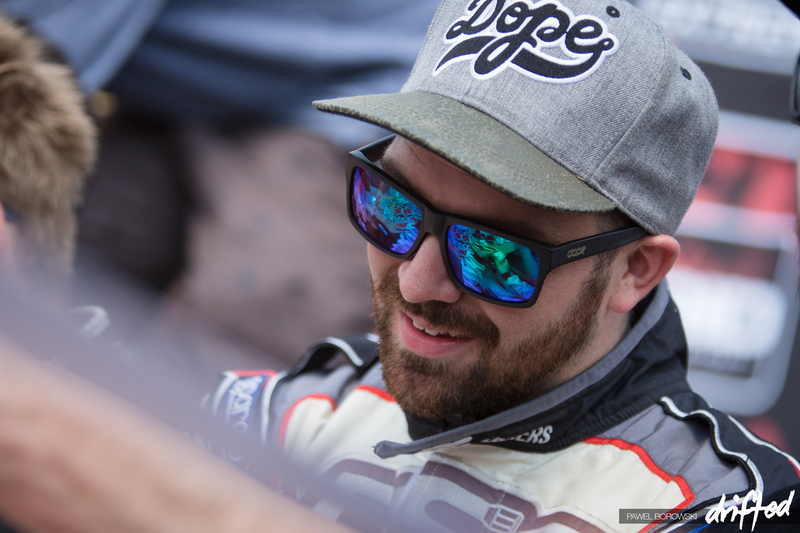 He would storm to first place in qualifying and take an additional few extra points going into Sunday’s main event. 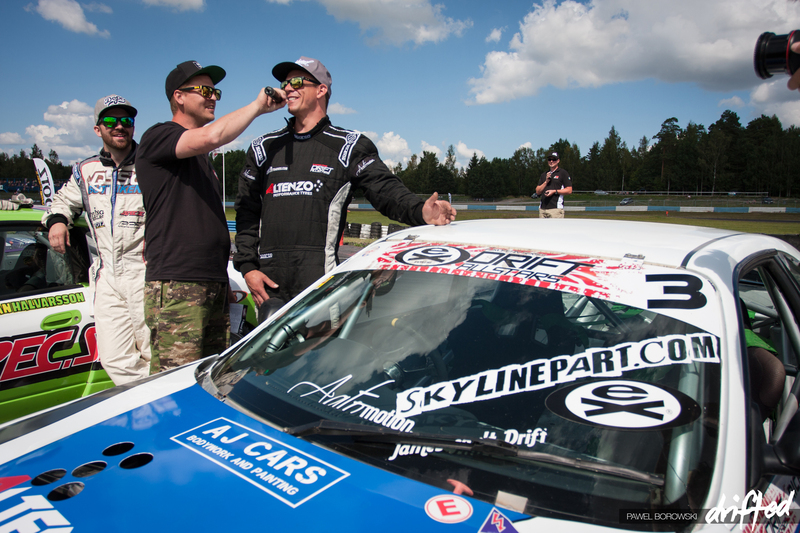 Jack Shanahan would find his form again and reliability in his brand new built Nissan S14 and take 5th place overall. 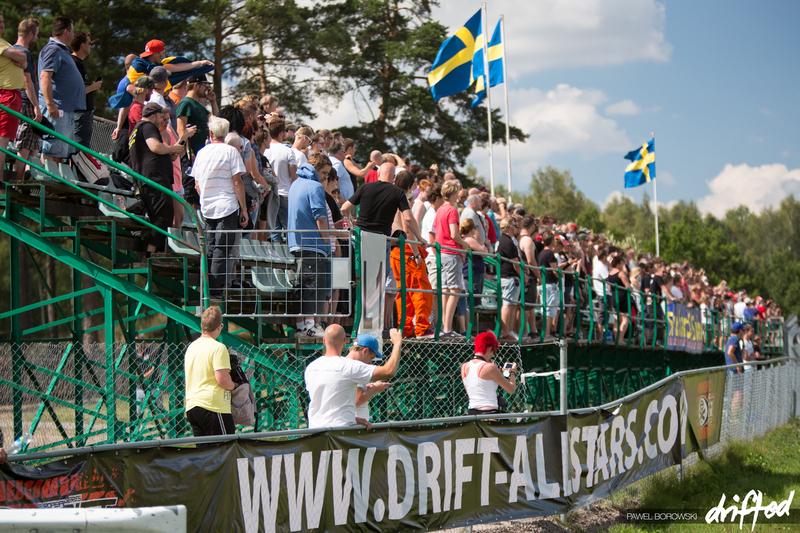 Mantorp park has the perfect layout for fans to see all the action. 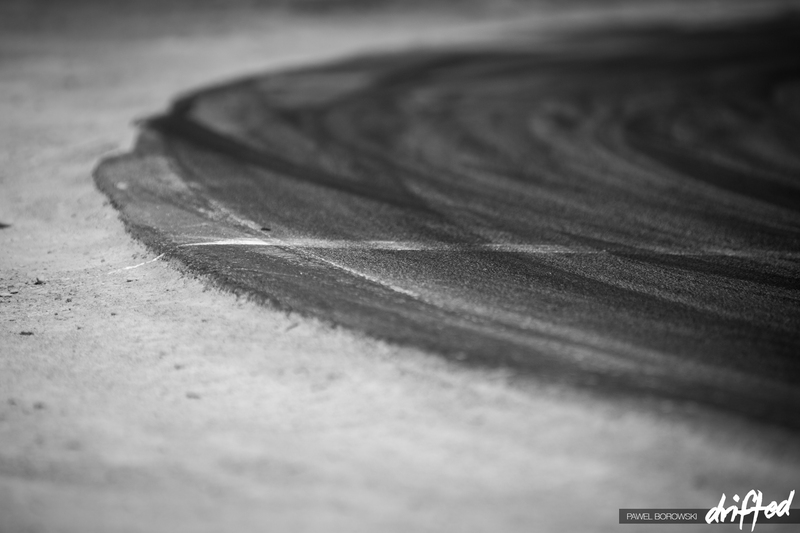 From all grandstands surrounding the drift track you have a perfect view. Fans came from all over Scandinavia to see Europe’s best. The top 32 battles would run quite fast. 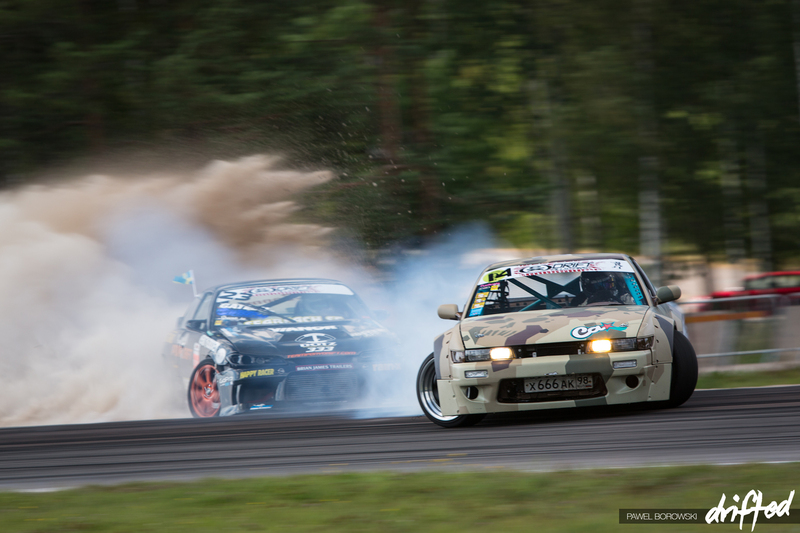 One of the battles of the top 32 bracket was Rasmus Moller from Team Pony Drift against Felix from Fail Crew. 18 year old Rasmus Moller was on flying form, but an off track excursion as enough to give him an early exit from the competition. 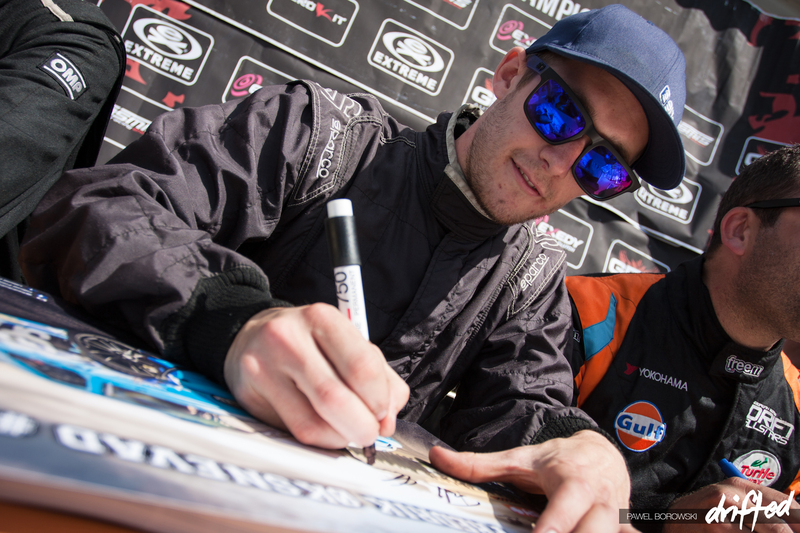 During the driver’s signings – Fredoxx is now a firm favourite with fans! Felix the Russian and Denis Martinson. Johan Mr Hollywood Halversen was one of the big fan favourites of the weekends. His fans were screaming, shouting and getting the air horns out! The Top 16 Ceremonies kicked off with the Swedish national anthem. But Martin Richards, as always, was keen to talk! Martin Richards would face the machine that is James Deane.R ichards car just would not have the forward bite and aggression of Deane who was given the win. 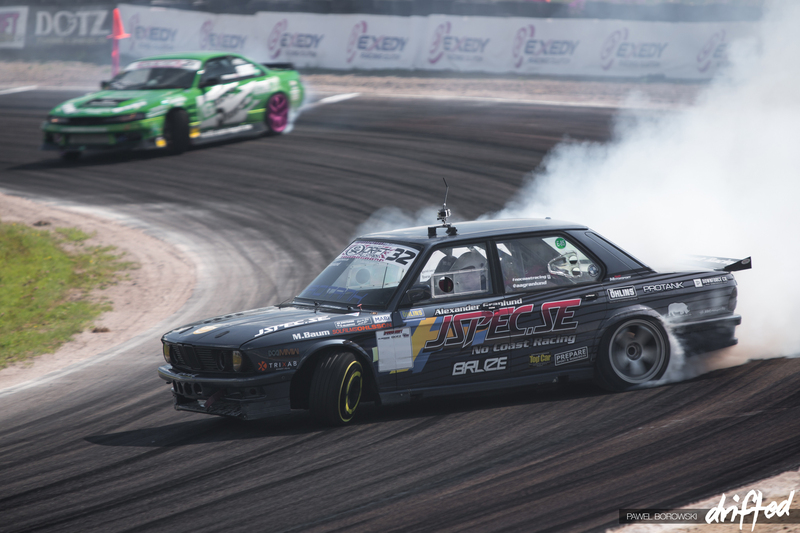 Another close battle would take place between Dmitriy Illyuk and James Deane but an off-track excursion from Illyuk would mark the end of his weekend. 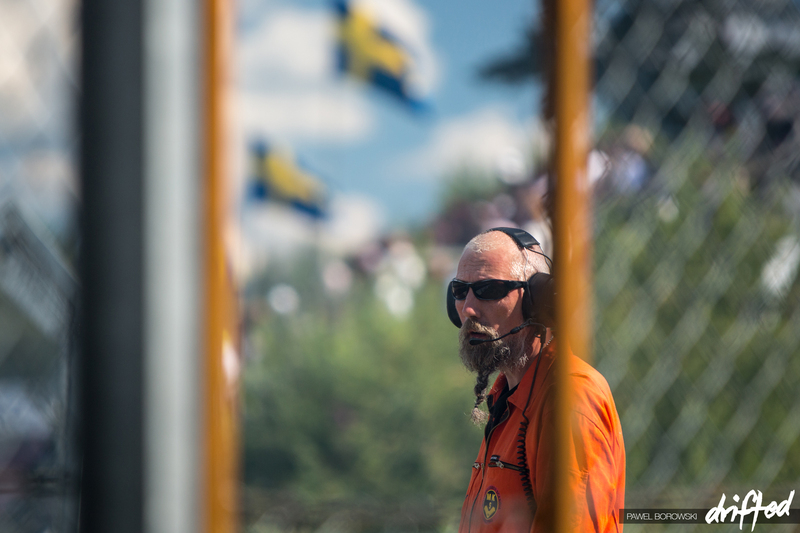 Marshals look on – is this the Bill Baldwin of Europe? Alexander Granlund would be on the form of his life. 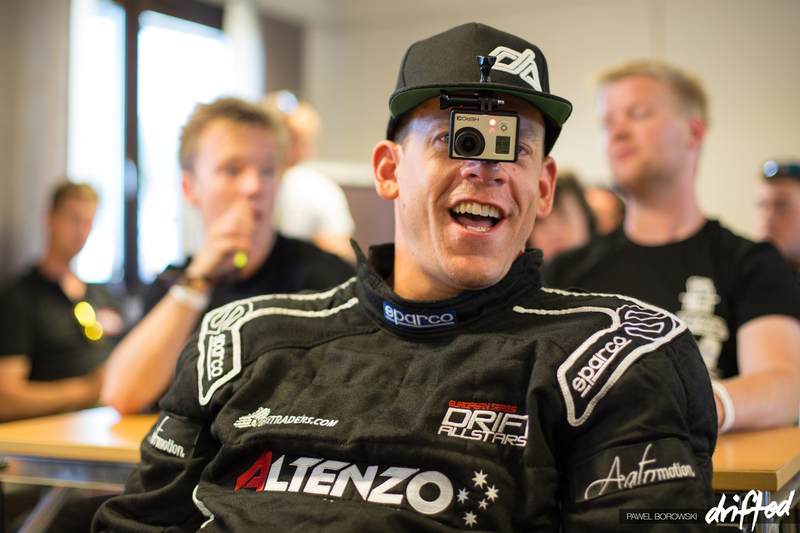 The top Swedish qualifying driver would progress through all his battles to the final. Here you can see him beating Odd Helge Helstead, the 17 year old Norwegian driver. Fredrik Øksnevad would push hard again in his Great 8 battle against Denis Martinsson with great speed and would also progress to the Semi Finals. 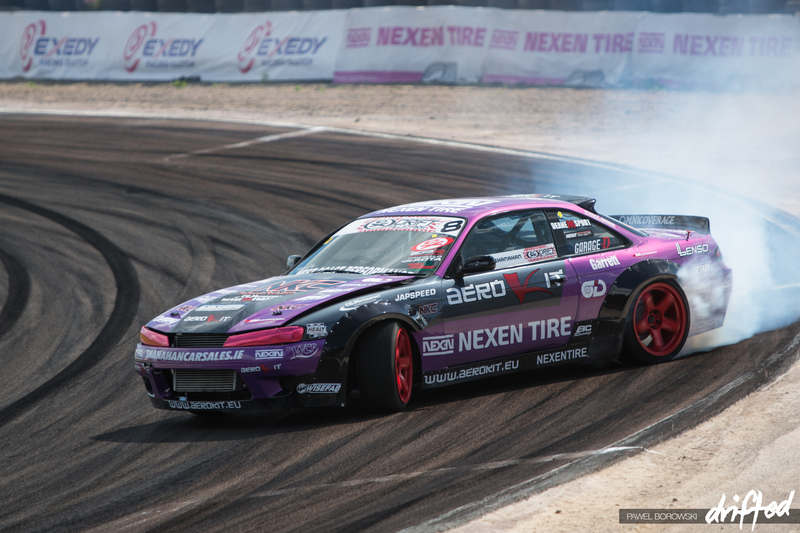 An all Nexen Tire Europe battle between Nigel Colfer and Jack Shanahan. Another very close battle between the two but Shanahan would have a advantage after Colfer developed a steering problem on the last corner, straightening. A big improvement for Nexen after their first two disappointing events. Deane Vs Shanahan would face off in the first Semi Final. Master Vs Student, this all-Irish battle was always going to be close. Deane would have more speed and proximity which would give him the advantage and win to move forward to the Final. Fredrik Øksnevad again proved his driving was no fluke and had far superior speed through the course then Alexander Granlund. 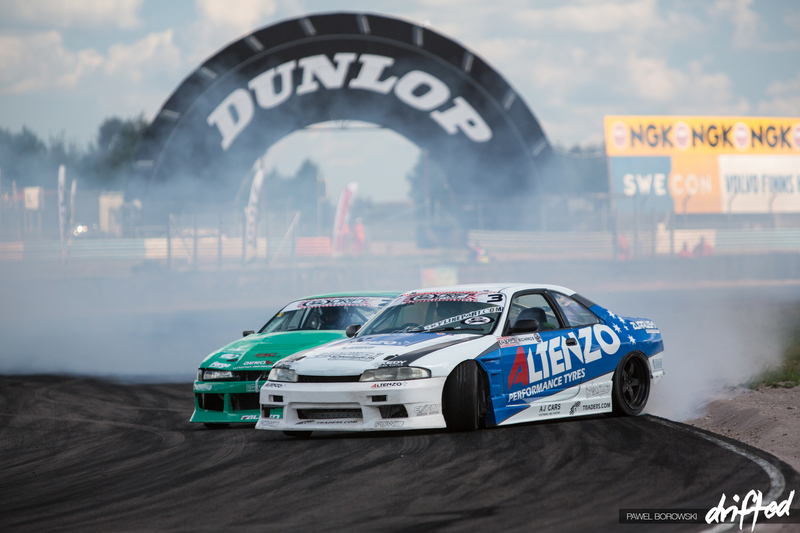 Fredoxx would win and progress to his first Final on his debut at Drift Allstars Europe – a pretty big result! 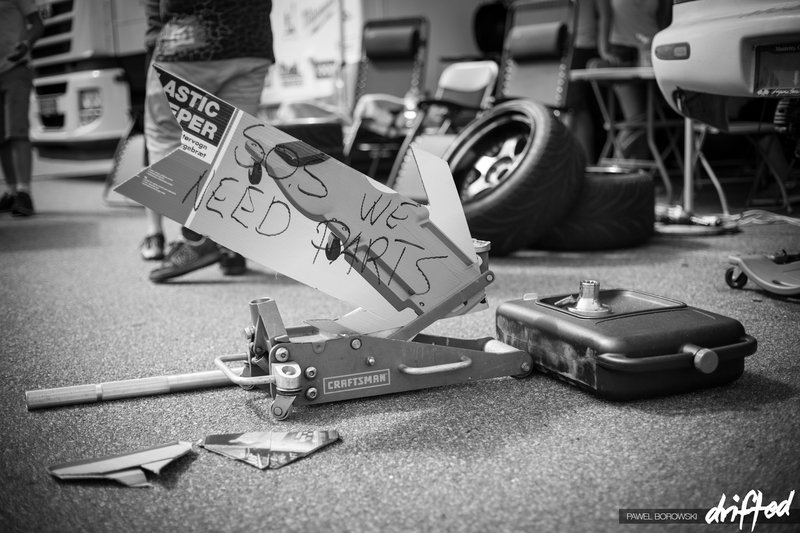 The Machine Deane would need to step it up for the final as Fredoxx was evenly matched for speed through the course. In the second run Deane stepped it up again and just followed Fredoxx with next to no space between the two cars, which would give him the advantage and win for the Final. Bespoke one of a kind DA trophies.There is only 21 of these in existence who will claim the most by the seasons end? 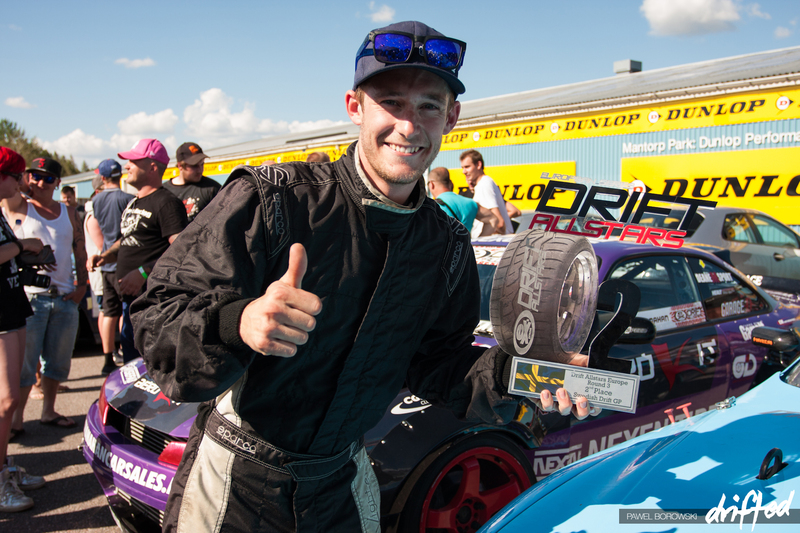 James Deane would take the win and one of the longest wins he has had to wait for after a troublesome start to the 2014 season. 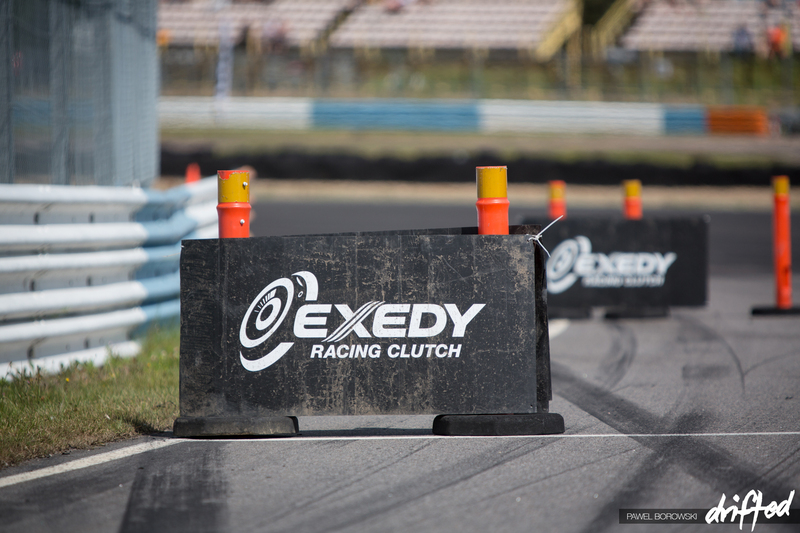 It has not come easy but as we go into the second half of the season things are about to get very interesting as some of the biggest lineup of Europe’s top professional drifters prepares to take on the legendary Riga City Circuit in Latvia! Champagne all round! 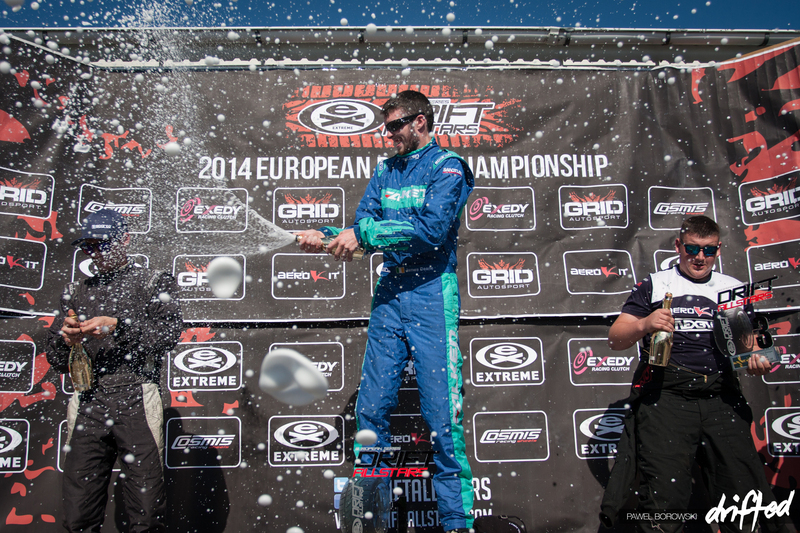 Jack Shanahan (still under age) is happy to spray some bubbly on his very first Drift Allstars Europe podium. No better person to spray champagne on but his coach as of the last two years, James Deane. 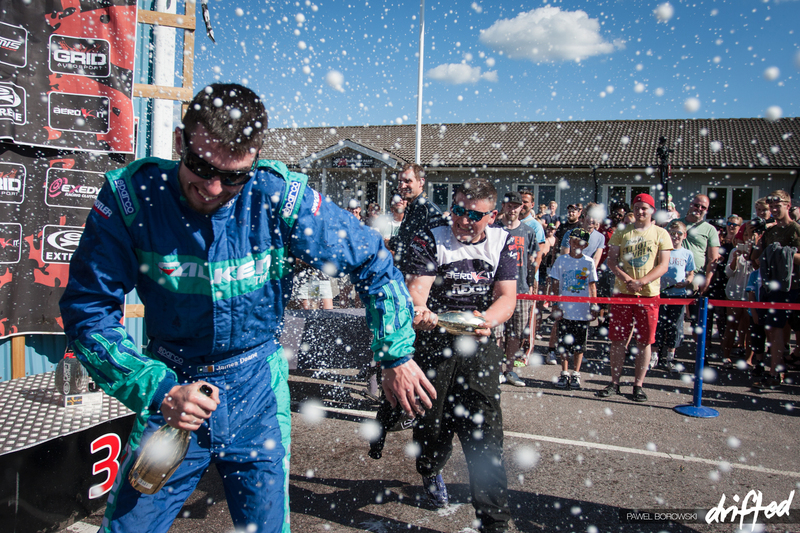 Fredrik Oskenavd was delighted to take 2nd overall on his Drift Allstars Europe debut. Fredoxx will be one to watch as we move into the eastern European legs. And also a big thank you to you the fans as Drift Allstars hit an incredidable milestone of over a million fans on Facebook this past weekend. 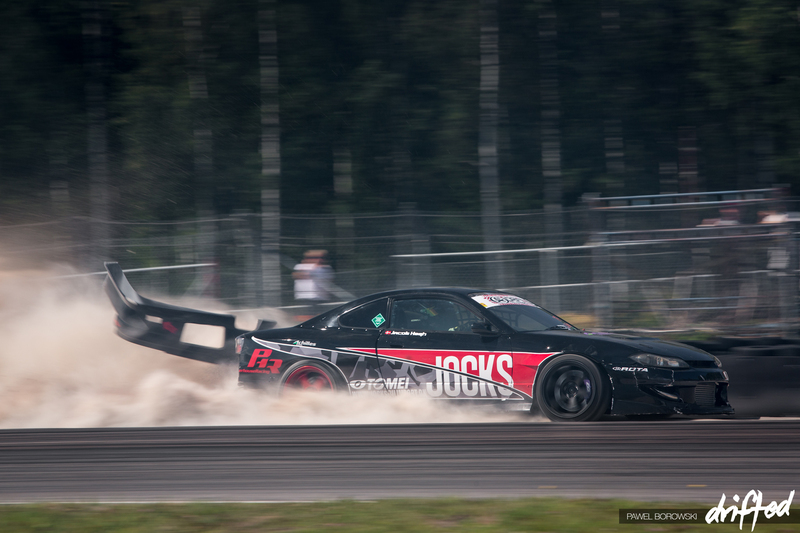 Here is to many more years of drifting in Scandinavia! 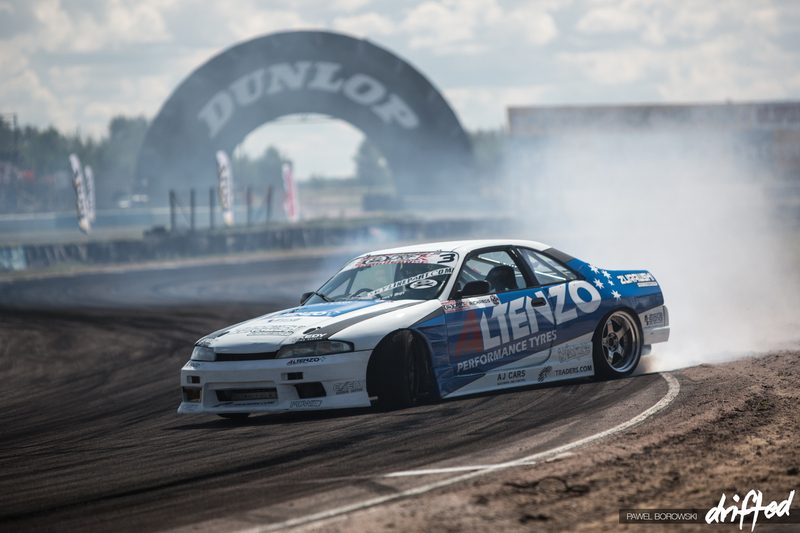 Our next stop is Drift Allstars Europe Round 4 – Latvian Drift GP at the Riga City Circuit where our own Jordan Butters will be giving his insight into European drifting! We’ll see you there!